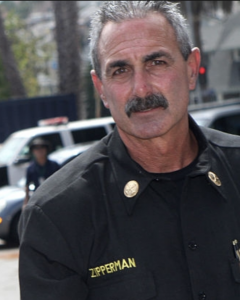 Dean Zipperman is Battalion Chief with the Los Angeles Fire Department. A 32-year veteran of the Fire Department he has been assigned to both administrative and operational commands in the LAFD. He is a strong advocate for firefighter safety, administrative due process, and workforce development. He is actively involved in projects that reflect the professional core beliefs of the Los Angeles Chief Officers Association and represents the C.O.A. on training and executive development. He is currently the Chief of LAFD In-Service Training where supervises and administers training to the 3400 uniformed men and women of the LAFD. Dean has an extensive background in emergency operations. He is known for his operational excellence, field credibility with the troops, and large-scale incident management experience. He has spent most of his career in operations and has worked at the busiest assignments in the LAFD, having promoted through the ranks including being an Apparatus Operator at the “busiest station in the nation”. He serves on the LAFD Training Committee and has authored many department operational bulletins aimed at providing improvements in firefighter safety, fire ground strategy and tactics, and the Incident Command System.